These holdfasts and hold downs are suitable for 1-inch diameter dog holes (equivalent to 25.4 mm). They have either a slightly undersize shank diameter or a conical shank. BENCHCRAFTED Holdfast Standard for 1 inch diameter dog holes There’s no mistaking the fact that these holdfasts made of carbon steel have been hand-forged. Made in the USA, they are manifestly rustic in appearance; they are large and heavy and above all indestructible. The shank diameter varies between 22 and 23 mm. This comparatively large difference to the hole diameter has the advantage that the holdfasts find an easy grip in the dog hole and do not slip through. A tap with a hammer is all it takes to loosen them again. The irregular shank surface improves the grip of these tools. The total length is 450 mm, the radial range is 200 mm. These holdfasts are not rustproof. They are dipped briefly in shellac prior to despatch so that they arrive as far as possible free of rust stains. Remove the shellac prior to first-time use either with alcohol or emery paper (120 to 150 grain). Additional roughening with emery paper will further enhance the grip of the shank. BENCHCRAFTED Holdfast Roubo Style for 1 inch diameter dog holes Working principle as above, but the shank is here slightly conical: 25 mm at the top and 19 mm at the bottom. The pressure plate is rounded by contrast with the essentially square and flat pressure plate of the Holdfast Standard. SJOEBERGS Hold Down QSH for 1 inch diameter dog holes Fits into dog holes on the work surface and also into holes on the front legs of the trestle and as such can assume the function of a bench slave. 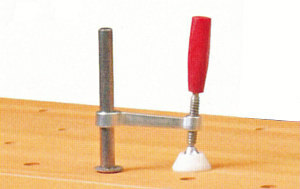 Fits all worktops with 1-inch diameter dog holes (equivalent to 25.4 mm). The diameter of the slightly undersize shank is 24.9 mm.